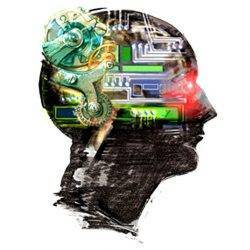 Artificial Intelligence (AI) and related technologies are projected to create as many jobs as they displace in the UK over the next 20 years, according to new analysis by PwC. In absolute terms, around 7 million existing jobs could be displaced, but around 7.2 million could be created, giving the UK a small net jobs boost of around 0.2 million. 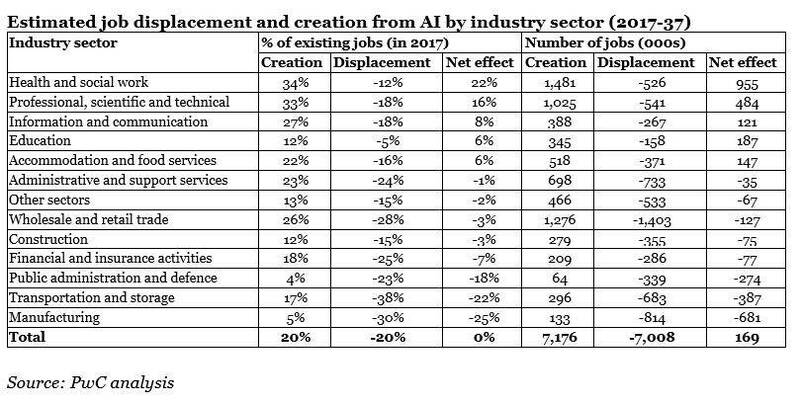 While the overall net effect of AI on UK jobs may be broadly neutral, this varies significantly across industry sectors. 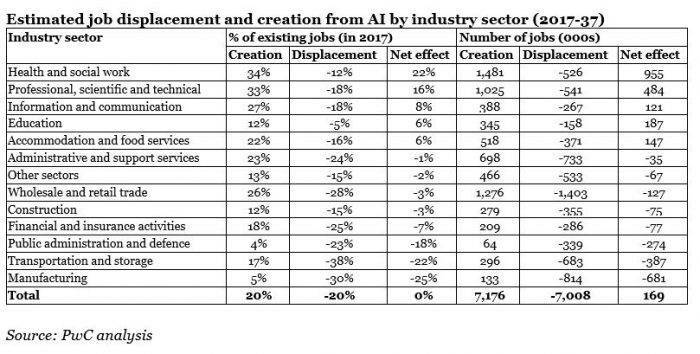 The most positive effect of AI is seen in the health and social work sector, where PwC estimates that employment could increase by nearly 1 million, equivalent to around 20 percent of existing jobs in the sector. On the other hand, PwC estimates the number of jobs in the manufacturing sector could be reduced by around 25 percent, representing a net loss of nearly 700,000 jobs. Based on differences in industry structure alone, the net effect of AI on jobs may not vary that much across the UK. London has the most positive estimated impact (+2 percent), which benefits from being home to 28 percent of the UK’s professional, scientific and technical activities, as well as 31 percent of the UK’s information and communication sector. In contrast, regions in the North and Midlands, with somewhat higher weightings towards relatively automatable industrial jobs, have marginally negative estimated net impacts, but only by around 1 percent or less of existing job numbers since even these regions are now dominated by service sector employment. However, there could be larger regional variations linked to factors other than industrial structure (e.g. relative skill levels across regions for jobs within a given industry sector), which are not reflected in this analysis for data availability reasons. PwC’s report highlights that how individuals, businesses and the government engage with AI and new technologies will affect how many jobs are created and how much it contributes to the UK economy. Government, in particular, can play an important role in steering the economy towards a more optimistic scenario by mitigating the costs of the displacement effect while maximising the positive income effects from AI and related technologies. There is the opportunity to build new regional identities around new services as a result of these sectoral changes, which could also help enhance civic pride. • Government should invest more in ‘STEAM’ skills that will be most useful to people in this increasingly automated world. This means focusing more on STEM subjects (science, technology, engineering and mathematics), but also exploring how art and design (the ‘A’ in ‘STEAM’) can feature at the heart of innovation. Governments should also encourage workers to continually update and adapt their skills so as to complement what machines can do. • Government should strengthen the safety net for those who find it hard to adjust to technological changes. • Place-based industrial strategy should target job creation. Central and local government bodies need to support sectors that can generate new jobs, for example through place-based strategies focused on university research centres, science parks and other enablers of business growth. • Government should implement its AI strategy in full, which sets out a broad range of policies to support development of the AI sector, linked into the broader industrial strategy. This would go a long way to maximising the income effect of AI on jobs in the UK. • Promoting effective competition: it is critical to maximising the income effect that the productivity gains from AI are passed through in large part to consumers through lower (quality-adjusted) prices. This requires competitive pressure to be maintained both in the technology sector producing the AI and in the sectors using it, so an effective competition policy will be important, balancing the need for a reasonable return to innovation with providing long term benefits to consumers. John Hawksworth, chief economist at PwC, said: “Major new technologies, from steam engines to computers, displace some existing jobs but also generate large productivity gains. This reduces prices and increases real income and spending levels, which in turn creates demand for additional workers. Our analysis suggests the same will be true of AI, robots and related technologies, but the distribution of jobs across sectors will shift considerably in the process. Euan Cameron, UK AI leader at PwC, commented: “AI offers a huge potential economic boost to the UK and it’s great to see the government recognise and support the development of the sector through the AI Sector Deal. People are understandably worried about the impact of AI on jobs, and businesses and the government need to address these concerns head on. Our research highlights where the biggest impacts will be and which areas are most vulnerable, so that businesses and government can plan how best to help people develop the skills that will prepare them for the future. As our analysis shows, there will be winners and losers. It’s likely that the fourth industrial revolution will favour those with strong digital skills, as well as capabilities like creativity and teamwork which machines find it harder to replicate.